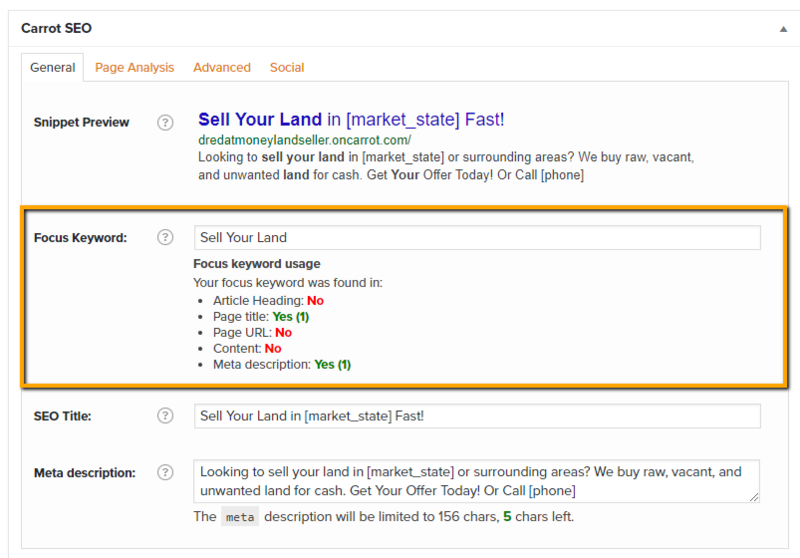 The purpose of this tutorial is to show you how you can utilize the SEO Grader installed on each page and post. This tool is an amazing resource if you are beginning to learn Search Engine Optimization and if you will update the content on your site. The tool allows you to insert 1 focus keyword and checks your content to determine if it is optimized for that keyword, providing areas of improvement for better optimization. We do not set a focus keyword within the tool on every page of your site but that doesn’t mean the page isn’t optimized. 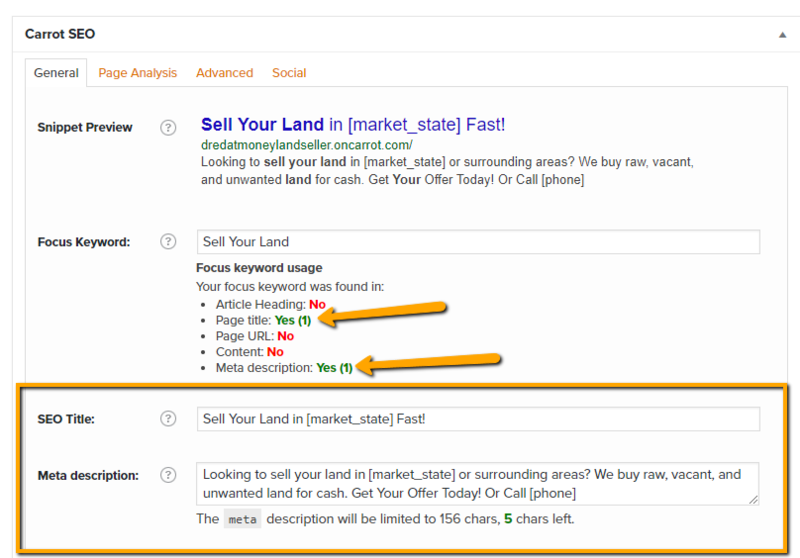 Our team chose to set a couple pages for your reference but the other pages are yours to choose the focus keyword. If you want to find out what keywords to use, our SEO Keyword Bible is listed in the Learn More section below. It is a handy resource to have beside you as you utilize this tool. * The Page URL is not able to be updated on your home page without attaching an entirely new domain. It plays a minor role in optimization and we don’t recommend updating the URL if you have already chosen one. The “Page Title” and “Meta Description” can be found immediately below the list. The “Article Heading” is the first editable box when you are editing the page. 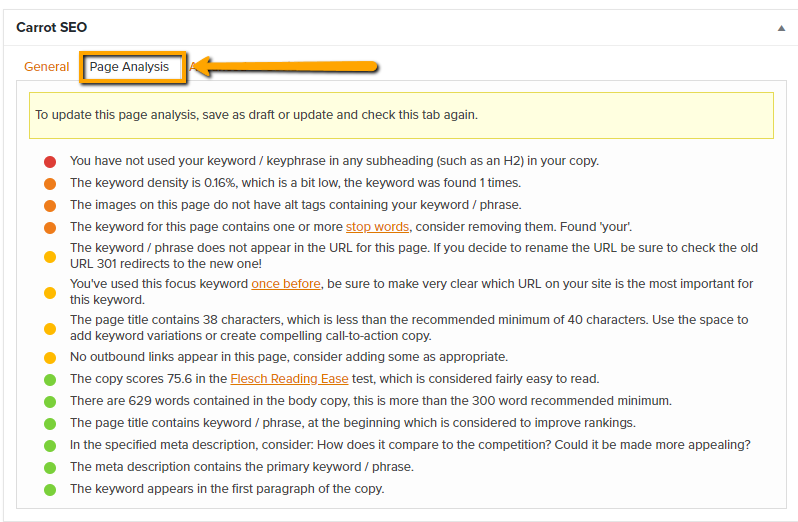 The “Page Analysis” gives you a detailed report of what you can do to optimize the page. You can not get every circle green but an overall score of green is what you are shooting for. This is found next to your update button on the top right of the page. Once all updates have been made and the page is optimized, you can go back to your pages and see an overall view of which pages have had a keyword assigned in the tool and what level of optimization they have for the keyword.